Today you are getting Zoologist Jessica instead of Homesteader Jessica. For those of you that don’t know, I went to school for zoology, but decided that I didn’t want to live in a city, which is what led me to farming. 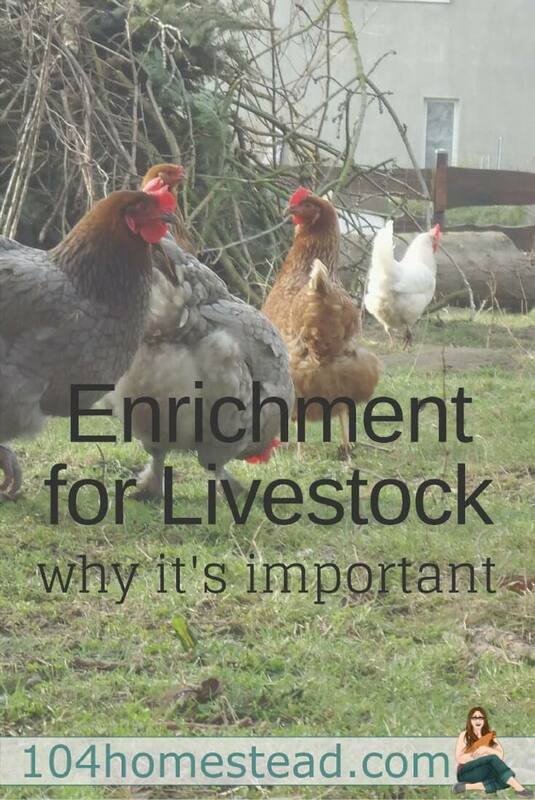 One important aspect of animal care they taught me about in college was animal enrichment and how important it is to an animals health and overall well-being. Animal enrichment is activities that create a more stimulating environment for the animals and elicit some of their natural behaviors such as exploration, foraging, locomotion, social interaction, manipulating objects, or simply playing. Let’s start with the fact that goats are herd animals. Being part of a herd makes the goat feel safe and secure. As pray animals, this safety and security is paramount to their mental well-being. Making sure your goat is part of a herd (at least one friend, but the more the merrier) will provide loads of enrichment for your goat just through herd interaction. Goats are incredibly intelligent and curious. This is a positive trait that is often viewed as a negative because learn how to escape. Goats can figure out goat latches, they can find holes and gaps in the fence and even make them large enough to escape, and they can climb almost anything. If you are not challenging your goat’s mind, they will escape. Challenging their mind doesn’t mean you need to build a fortress around your goats. Give them something more exciting to try to figure out. Climbing is one of a goat’s favorite things to do. Instead of having them trying to climb the fence all day (which will wear out your fence real fast – ask me how I know) give them a jungle gym. It doesn’t have to cost much and it doesn’t have to be elaborate. We started with a wooden picnic table and slowly added “junk” to it over time. The goats love climbing over and under the different materials. Here’s a trick I came up with that is unrelated, but worth mentioning: Top your wooden climbing toys with roofing shingles. The rough surface files down hooves so you don’t have to trim as often. Another thing goats enjoy is problem solving. While you may not want them to solve the puzzle of the gate latch, give them another puzzle to solve. Cause and effect games are great for goats. You can incorporate climbing, like with a seesaw, or doing something stationary like providing a treat ball. Remember, a healthy goat is an active goat. It is important to provide ample opportunity for exercise mentally and physically. Much like with goats, friends and family are important to poultry in the form of a flock. Flock interaction accounts for much of a bird’s enrichment needs. But that’s not all they need. Poultry that is not adequately enriched will display many problem behaviors such as feather picking, bullying, and even egg eating. In the ideal situation, your chickens, ducks, and quail would be allowed to free range in a large area where they can explore, forage, and interact. For many of us, that’s not an option. If you cannot free range your chickens because of space or predator issues, it is your responsibility to provide enrichment. The good news is that many of your daily routines are a starting point to enrichment. You are already going in to collect eggs, while you’re there you should move something. It’s amazing how something as simple as moving a stall rake can excite your poultry. Composting in your poultry run is a great form of enrichment. Not only do they get to dig for all sorts of goodies, but they are also getting a varied diet. Quail can’t necessarily have a full-fledged compost bin in their enclosure, but they appreciate kitchen scraps. For important information about what can and cannot be composted with chickens, see here. The best part of composting with chickens is how quickly they break down a compost pile. It’s truly impressive and my green thumb appreciates it. Dust bathes are another important multi-aspect enrichment for poultry (less for ducks, but a huge win for chickens and quail). Not only do quail and chickens enjoy digging and cooling themselves off on a hot day, but dust baths clean the bird as well. To boost the cleaning and bug-removing properties of your dust bath, mix in a little diatomaceous earth and wood ash. Just make sure if you add wood ash it’s in a dry location because water makes the ask caustic. 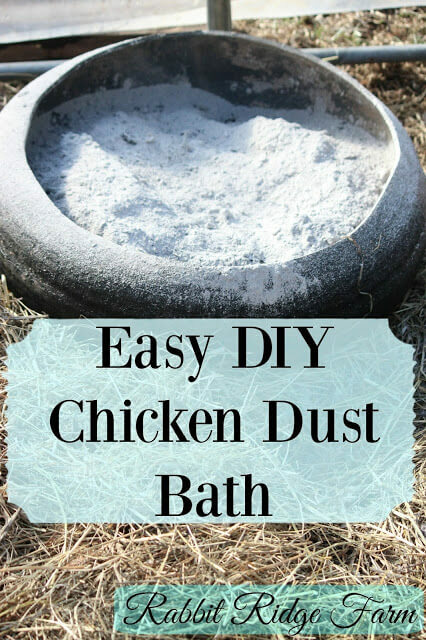 Find out how to make this easy do-it-yourself chicken dust bath at Rabbit Ridge Farm. Kiddie pools aren’t just for ducks, though deep ones should only be accessible to water fowl. My ducks love their kiddie pool when it’s clean and full. They swim and splash and play. I noticed when the pool would get shallow (because of the ducks’ maniacal splashing) the chickens would stand in it on hot days. I offered the quail a small dish and they did the same. They love it. Rabbits are also not solitary creatures. Are you catching on to the pattern here? Humans are wonderful, but they are not a substitute for a companion. Rabbit’s lives can be summed up in three simple things: dig, tunnel, chew. If you provide enrichment opportunities that cover these three areas, you are good to go. If your rabbit is contained in a tractor or allowed to free-range, it has ample opportunity to explore and behave normally. Again, this isn’t an option for most people. This one is super simple. Find a container and fill it with stuff. The container can be a shoe box, the shipping box from your latest Amazon purchase, a paper bag, or anything else that isn’t harmful when chewed and possibly consumed. Filler can be hay, soil, grass, shredded paper, or small branches. You can even hide treats in the filler to make it even more exciting for your rabbits. Tunneling is much like digging. Find a container that is safe when chewed and make holes in it for the rabbit to climb through. Plastic tubes can be really fun, just make sure your bunny isn’t going to get trapped inside. Flower pots that are tilted slightly are really exciting to rabbits. Just make sure it won’t fall and trap the animal. With a little imagination you can create an entire obstacle course. These rabbit treats are cheaper then buying pre-made blocks at the feed store, super easy, and jam packed with nutrients. Find out how to make them at Chickadee Homestead. If allowed to chew on it, your rabbit will. The possibilities are endless. There are hundreds of sites on the internet that have lists of what your livestock needs. They all sum it up as food, water, shelter, and maybe some medications in case of emergency. As a zoologist I have to tell you, that’s not enough. Many livestock animals are not suited to being house pets. They belong outdoors. If you are bringing an animal indoors (any animal from goldfish to potbelly pig) it is even more important that you enrich that animal’s life. Food, water, and shelter might keep the animal alive, but what kind of life is it? Some toys we have on our homestead for the livestock: Precision Pet Chicken Treat Ball, Peter’s Woven Grass Play Ball for Rabbits, and Jolly Pets Tug-n-Toss Chew Ball. Share your best ideas in the comments below. I absolutely LOVE this! 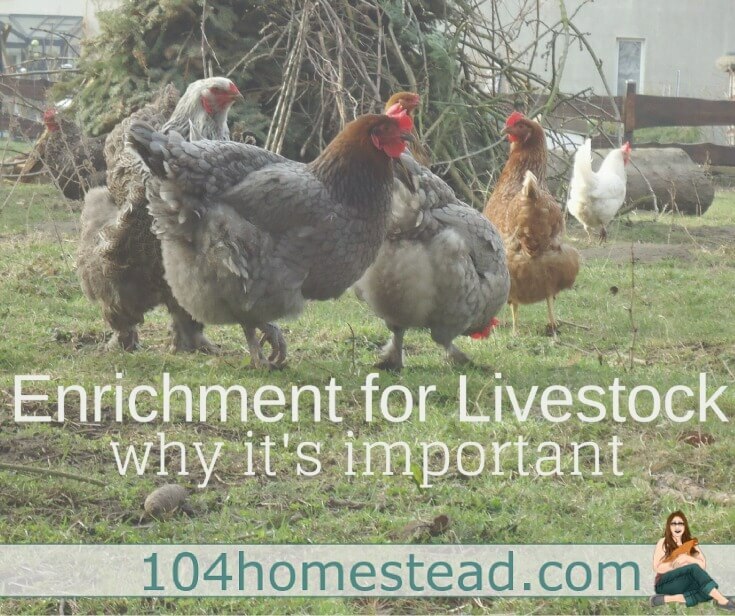 As an animal science graduate turned stay at home mom, I am so glad to see others who see the importance of enrichment with their pets and farm animals. I just subscribed because of this post. I’d love to see more like it in the future ? Have a wonderful day! I have a question regarding duck enrichment in winter. We live in southern Ontario and have 5 ducks, 4 hens and a drake, that we allow to free range on our one acre. In the summer they wander about at will, sometimes further afield that we like since they are blissfully unaware of property lines, and splash about in their kiddie pool. In the winter, they are still free but choose to stay within a short distance of their coop. They don’t much like wind but quite happily stay outside on frigid days or while its snowing. Cold hardiness apparent, they even seem to snow bathe some days, preening and flapping in the snow and some days they seem to be foraging around on the snow covered ground (no idea if there’s anything available to them when the ground is frozen). So, my question is, is this enough enrichment in the winter when the foraging is scarce and they choose to stick so closeby, mostly just sitting together on the snow? Winter is a tough time for enrichment. My ducks, like yours, seem happy to just stick their bills in the snow. I can’t imagine they’re finding anything in there (we have about 3′ of snow now), but it makes them happy so who am I to judge. I like to toss out some evergreen branches for them from time to time. They like to nibble on them and play in them. That’s about the extent of what I can offer in the winter. If it’s a nice warm(ish) day I might pull out one of the bigger rubber feeders and fill it with water for them. Just make sure to place it away from areas you walk regularly because there will be a big sheet of ice on the ground when they’re done. I loved that goat video! Wow! Great suggestions! Thanks for shedding light on a subject not often explored.